The World Cup is over and we’re all very sad about that about that. Yesterday we looked at what we got right and wrong about the teams in this tournament. Today, we’ve gathered to discuss some of the highs and lows from the 2014 World Cup. Jordan: Germany 2-1 Algeria (AET). I’ll remember this game more than anything for the beauty of Manuel Neuer’s heat map and his overall performance in the game. He managed to stop so many Algerian attacks before they even started. Rais M’Bolhi also had a great game as did really everyone on Algeria. This was the best game of the tournament for me because it featured an underdog giving a powerhouse team all they could take. 38 shots between the two teams didn’t hurt either. Jeremy: Belgium 2-1 United States (AET). The final game from the round of 16 was dominated by the Belgians, yet it entered extra time goalless thanks to a heroic first 90 from U.S. keeper Tim Howard and a wasted chance by Chris Wondolowski at the death. Kevin de Bruyne was phenomenal, scoring the opener in the 93rd minute and creating TEN chances, including Romelu Lukaku’s eventual winner in the 105th minute. The U.S. woke up after Julian Green’s goal, nearly equalizing seven minutes from the end, but Thibaut Courtois came up big to secure advancement for Belgium. Ahmad: Chile 1-1 Brazil (Brazil won 3-2 on penalties). This game was the first game of the knockout round and boy was it awesome. The Chileans gave the hosts everything they could handle, and were at times the superior squad. Alexis Sanchez was spectacular for Coach Pitbull’s side, and Gary “The Pitbull” Medel played the game with his leg held together by sticky tape. In the 119th minute, Mauricio Pinilla almost won the game for Chile, but his shot hit the crossbar. Pinilla was so scarred by that miss that he tattooed it on his arm. Moe: Netherlands 3-2 Australia. It was a back and forth affair that one couldn’t take their eyes off of. It was the type of game more fitting for a FIFA 14 simulation than one seen in international football, with a breakneck pace, numerous counter attacks and Tim Cahill scoring one of the great volleys in recent World Cup history. In a way it’s a shame that Australia were on the wrong end of two thrillers against Chile and the Netherlands, and perhaps with more luck here and there Australia could’ve sneaked their way into the knockout stage and give us one more show. Jordan: Japan 0-0 Greece. Iran and Nigeria is too easy to pick. Everyone expected that game to be a painfully boring 0-0 and it was. This game wasn’t necessarily boring as it was pathetic to watch. Greece got a red card and somehow became even more defensive. Japan seemingly had infinite chances but couldn’t finish to save their lives. I wasn’t expecting this to be a barn burner but both teams just played poorly. Jeremy: France 0-1 Germany. Isn’t it funny how the eventual World Cup winners played in the tournament’s worst game? At no point after Hummels’ goal did this game intrigue me. Germany’s midfield overwhelmed a lethargic and stubborn France (Deschamps’ first sub entered the match 17 minutes from the end). France’s best chance came in second-half injury time, but Karim Benzema’s rocket was punched away with little effort by Manuel Neuer. A snoozer. Ahmad: Brazil 3-1 Croatia. The opening game of the World Cup wasn’t boring. It was actually very exciting. The thing that made me pick this game was the fact that Croatia was so blatantly robbed of getting a result. We kinda knew going in that the refs were going to be lenient and forgiving with the host nation, but we didn’t think it was going to be this bad. Croatia lost because Fred shamelessly dived and earned a penalty to put his country up. Prior to that, Croatia was arguably the better side. Football is cruel. Moe: Netherlands 0-0 Argentina (Argentina won 4-2 on penalties). The less we speak about this game, the better. Jordan: James v. Uruguay. James’ goal beats out RVP and Cahill for me because of the audacity it takes to try to score from there. For both RVP and Cahill they really have no option but to try to score when they received the ball. James could’ve very easily chested the ball down and done plenty of things that weren’t hit a dazzling half volley. But he did. The audacity and presence of mind of mind it took for James to decide shoot and ultimately score is why that’s better than RVP or Cahill for me. Jeremy: Mario Gotze vs. Argentina. You may accuse me of recency bias (James/RvP/Cahill are all great candidates), but for my money, this was the best (and biggest) goal of the World Cup. The power and pace in Schürrle’s run, the read by Götze, the spectacular volley close to the six-yard box…splendid goal, absolutely splendid. Ahmad: David Villa vs Australia. Spain were awful during this World Cup. They were the first side to be eliminated from the WC. They went into the Australia game with nothing to play for. It was pretty much the end of an era. Don’t tell that to Villa, though. The guy with the most goals ever for Spain decided to end his international career with a cheeky back heel, showing everyone that you know what? He still got it. Moe: Tim Cahill vs Netherlands. Speaking of the Socceroos, it’s our good ole friend Tim Cahill. The best part about this volley is how few seconds it came off of Robben’s goal that gave the Dutch the lead. It was almost as if he said to Robben “anything you can do, I can do better”, and on that volley he did. That probably was the last we’ll ever see of Tim Cahill in the World Cup and good lord that’s the way to go out. Jordan: Juan Cuadrado. I knew he was a pretty solid player for Fiorentina and someone who was gonna be key for Colombia. I wasn’t expecting him to have four assists and a goal in five matches. 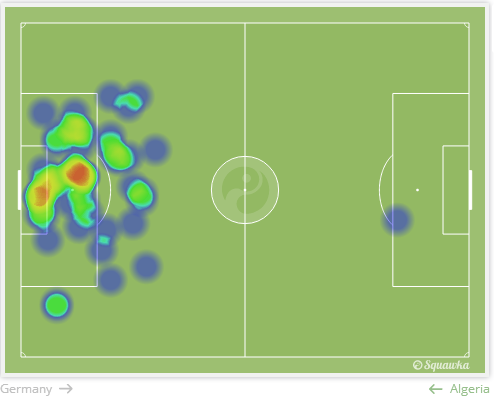 While James deservedly got all the headlines, Cuadrado also played a huge role in Colombia’s quarterfinal appearance. Jeremy: Ricardo Rodriguez. His tournament ended too soon, but the Wolfsburg left-back acquitted himself extremely well in Brazil. His World Cup kicked off with a masterpiece against Ecuador, in which he assisted on both goals, and for the tournament, Rodriguez averaged five tackles, four clearances, and three interceptions per game while establishing himself as a menace bombing forward. Wolfsburg may find it difficult to keep Rodriguez, however, as Arsenal, Liverpool, and Manchester United have all expressed interest in the young star. Ahmad: Ricardo Rodriguez. This World Cup was full of standout fullbacks, and Rodriguez was one of the best. From the first game against Ecuador, where he assisted both Swiss goals, Rodriguez showed his attacking prowess and was a constant threat going forward. The game against France is perhaps best forgotten by everyone Swiss ever, but Rodriguez showed enough potential to attract the attention of Manchester United, who apparently want all the left backs. Moe: Ron Vlaar. This World Cup to be frank was all about attacking football and selecting a center back as a breakout star is probably dumb on my part, but Ron Vlaar was damn good during this World Cup. He and Javier Mascherano were magnificent in their semifinal encounter. His jump in pass completion % from his domestic season with Aston Villa to what he produced in the World Cup was stunning. He was a rock through and through, something that wasn’t really the case for most CB’s in the World Cup this time around. Jordan: Igor Akinfeev. Akinfeev is not only the captain of Russia but CSKA Moscow as well. He allowed the fewest amount of goals in the Russian Premier League and everything I’ve read and seen gives the impression he is thought of very highly in Russia. Then he on the global stage he made two huge mistakes that led to his country being eliminated. Jeremy: Iker Casillas. As Ahmad and me have pointed out before, nothing went right for Spain in this World Cup. But Casillas, fresh off a European Cup win (in which he conceded due to a blunder, as you may recall), may have been worst of all. All credit to the Fred/Hulk/Jô nightmare the hosts trudged out, but Casillas looked hammered in net for the Spaniards. In particular, he was absolutely abused by Arjen Robben here, and this critical error against Chile ended all hopes of a roja rally. Ahmad: Steven Gerrard. I’m not a big fan of defensive midfielder Steven Gerrard. This has been chronicled ad nauseam on Twitter. The guy lacks defensive positional awareness, doesn’t run AT ALL, and sometimes goes on maddening runs to join the attack, which sort of leaves his defense exposed. Everyone piled the hate on Wayne Rooney, blaming him for England’s woes, but, as I wrote here, Gerrard has been pretty awful as well. That he gifted his club teammate Luis Suarez an assist for him to bury England just cements it. 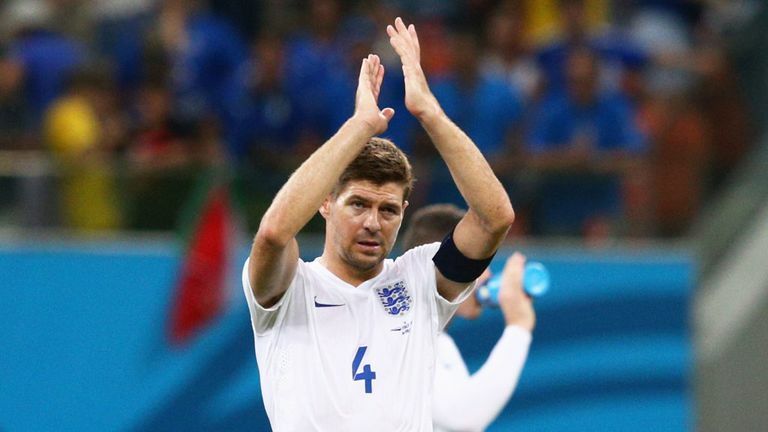 Steven Gerrard slipped again, and England fell as a result. Moe: Paulinho. Paulinho had a middling season for Tottenham after securing a big money move last summer in part because of his performance in the 2013 Confederations Cup. I did expect him to rebound a bit in part because there are some players who do over perform in the international stage relative to what they produce domestically, and I thought Paulinho would be one of those players. He didn’t and the cries from many were to sub in Fernandinho who in contrast had a real good season for Manchester City as they won the domestic double. Now truth be told Fernandinho was an embarrassment versus Germany, but Paulinho before then didn’t do much favors either. Jordan: I picked up a lot of Twitter followers, which was nice. This my first World Cup where I actually had heard of 95% of the players which made it a lot more fun than 2010. I’m really proud of what the USA did (read here) and can’t wait to see what guys like Green and Yedlin do in Russia. Jeremy: Only France ’98 saw more goals scored than Brazil ’14. That’s pretty cool. Also, Rooney’s “corner” against Italy was the funniest moment of the World Cup. I can’t wait four more years. Moe: Miguel Herrera, Thank You!